Well this has been such a busy week and we have missed or will miss several planned OCA events including, Astroimagers SIG and the General Meeting. 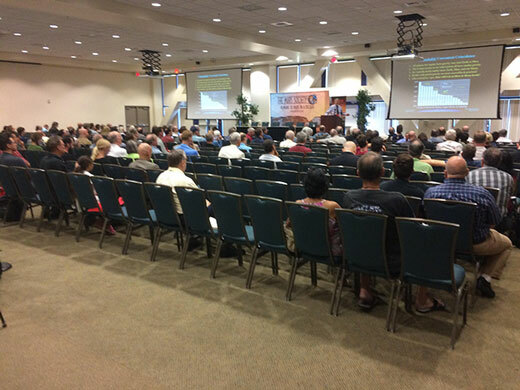 We have been busy at the 20th annual international Mars Society meeting at UCI. This week we are packing and getting ready for our Iceland cruise next week and will miss the OCA Astrophysics SIG and the OCA Blackstar canyon star party again. We hope to see all the sights there, but especially the Northern Lights and Milky Way. Now, there is just enough time to discuss a neat homework problem from Astrophysics: The Violent Universe and offer a few comments from the Mars Society convention. First, it seems that no matter what else is going on, the homework doesn't go away and still needs to be completed. This time though, a really neat worked example on interpreting supernova spectrum was presented and I found it especially informative. Have you ever wondered how the spectra and red shift of objects, like supernovas, can be used to identify the type of supernova and velocity at which it is moving away from us and how fast the gas in the supernova remnant is moving away from the exploding star? 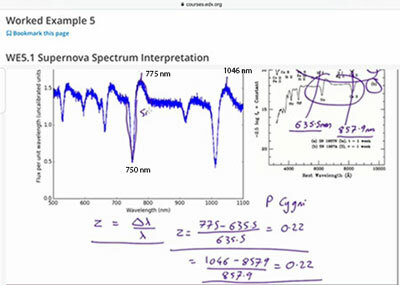 In this worked example, you can see how the initial choice of two spectral lines, observed at 775 nm and 1076 nm, indeed do correspond to laboratory emissions at 635 nm and 857.9 nm, since the redshift of 0.22 is the same between the pair. Wow, so the observed object is at a distance corresponding to a redshift of z = 0.22. This by itself is pretty neat and illustrates what can be learned by examining the spectra from deep sky objects. The second lesson to be learned here is that by examining the redshift from the emission peak at 775 nm and the absorption minima at 750 nm, we can determine the speed with which the gas is moving away from the supernova. The red shift of the gas is determined from the emission at 750 nm off to the side of the nebula and at 775 nm right at the center of the supernova. This redshift, or Doppler shift in this case, of 25 nm corresponds to an expanding shell of gas moving at 9677 kilometers per second. That is pretty neat and the course is very interesting and if you find it interesting be sure to keep watching for more. There was also a bit of discussion about the different spectra for Type I and Type II supernova, which I didn't quite understand and will have to go back and listen to that section again. But that is what going to school is all about! 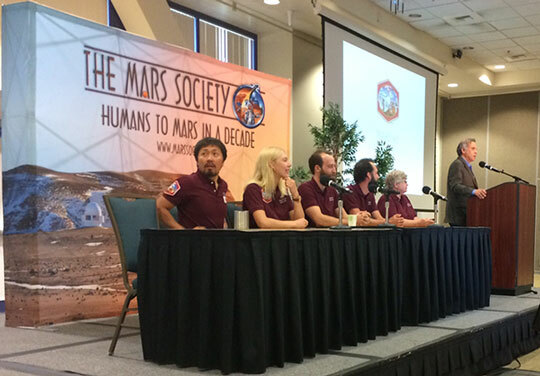 Now, let's move on to the four day Mars Society conference held at UCI. 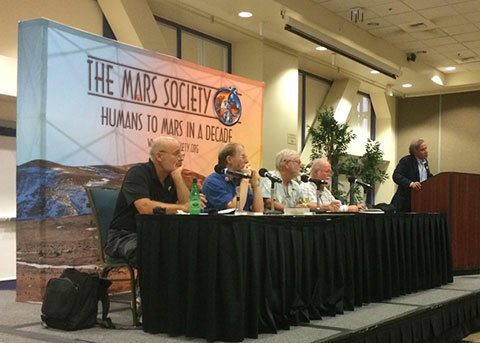 This is my first attendance at the Mars Society, even thought this is the 20th annual conference. By the way, I should first of all correct the last post's cost of the conference, which I erroneously posted as $270, which was the at the door cost, but for us early registrants, the cost was only $70, so be sure to sign up early in the future. It was very good to see many others of the OCA science squad in attendance. Good to see you, Scott, Sandra, Dave, and Don! Where were the rest of you? I hope you weren't put off by my misquoting the cost of the conference? Anyway, thanks to Math Whiz Dave, who alerted us to this conference back in May. See below for a photo of one of the plenary sessions. There were many interesting plenary speakers and then four separate breakout sessions for more detailed and specific topics. One of the things the Mars Society sponsors is analog versions of teams, who spend isolated time in earthbound isolated locations performing simulated missions as if they were on Mars. The photo below shows some of the Mars 160 team who spent weeks isolated at the Mars Desert Research Center doing simulated research. This and previous teams have learned so much about what and how actual astronauts might experience. Thanks to all the volunteers that make up these international teams! There were many breakout sessions and so we could pick and choose depending on our own specific interests. One session that I especially enjoyed, and in fact turned out to be one of the prize winning best presentations, was one that covered how to construct habitable structures on Mars, out of ice, which allowed for protection from hostile solar and cosmic radiation, and also used materials, such as ice, which could be found by supposedly drilling beneath the Martian surface. The use of 3-D printers, to encapsulate frozen blocks of ice in plastic, inflatable structures, to prevent the sublimation of the ice in the dry, low pressure Mars atmosphere, was very innovative. Anyway, thanks for that presentation on "Mars Icehouse", Melodie Yashar! 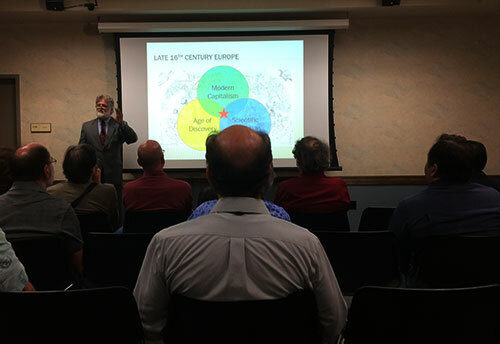 Another session presentation that I found very interesting was one by university professor, Brent Lane, on the parallels between evolution of enterprise-based exploration from the 16th century to the 21st century. He started with the case of Walter Raleigh and the failed Roanoke settlement and the mostly successful Jamestown settlement and how the combination of private and public financing figured in these historical events. He cautioned and urged all of the Mars devotees to study history and learn from history as they try to develop plans for the exploration and colonization of Mars. It is more than just technology, because it is a human endeavor and human endeavors have been covered many times in history. There were many other discussions in other sessions regarding the public vs. private funding of space exploration. Today, we have many examples of private funding by public billionaires. Many speakers were quite negative about NASA and how spending on Mars exploration often gets deferred or not incorporated in plans and how large corporate interests and influential congressmen are said to derail some plans in favor of others. Anyway, the winners and losers continue to disagree and try to understand how government agency decisions are made in reality. Many advocates of going to Mars and colonizing Mars are big fans of science fiction. One of the plenary sessions included a panel session of well known sci-fi writers. We know that sci-fi deals not so much with science in the future, but with humans placed in situations, often in the future with advanced science, but the emphasis is on how the humans adapt to these future situations. It was really neat to hear the interaction between these sci-fi writers and their interpretation of the future. Of course, many sci-fi novels involve heroes and heroines in distress and the following poster, actually from a previous space conference, shows one artists conception of adventures and going to Mars. Many of the breakout sessions, in addition to trying to sell all of us on the desire to go to Mars, actually covered some of the technical issues of getting to Mars, of landing on Mars, and surviving and colonizing Mars. A great summary of some of these technical issues is found in Dr. Robert Zubrin's book, "The Case for Mars." 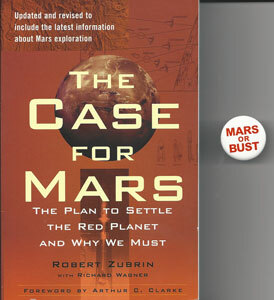 Zubrin is the current president of the Mars Society. I have the signed copy of the book and will add it to the nearly 3 foot high stack of interesting books yet to be read. 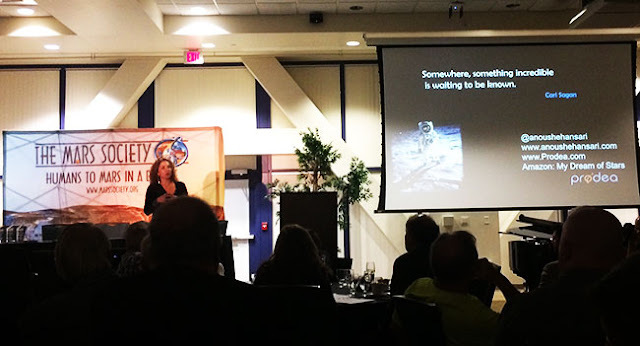 The Mars Society awards banquet speaker was Ms. Anousheh Ansari, who as a very successful entrepreneur and space enthusiast described her training and eventual trip to the ISS. 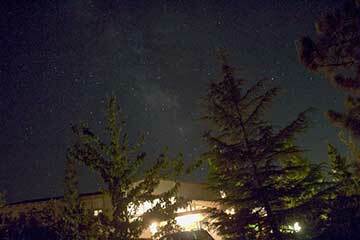 Her story was very interesting and is described in her latest book, "My Dreams of Stars." Her story, from exile from Iran, to successful entrepreneur to space enthusiast and ISS visitor was very exciting. She is also the sponsor of the $10 million X-prize, won by Virgin Galactic. Thanks for your story and support!